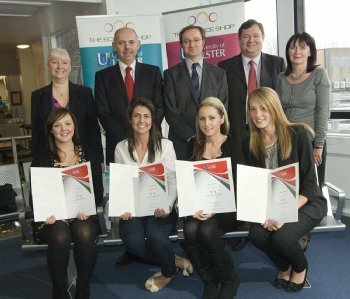 First year BSc Marketing students have provided an award-winning marketing solution to Mourne Heritage Trust (MHT). Tasked with reviewing and reinventing a marketing strategy for the company’s website and social network coverage, 95 students divided into 20 consultancy teams to present their campaign to MHT chief executive Martin Carey. 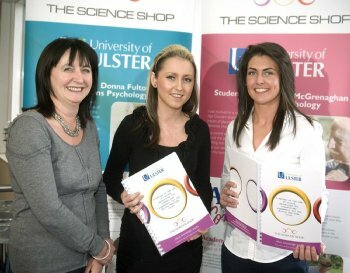 The student team that achieved the highest mark in the task was made up of Lauren Morton and Stacey Rooney (Andersonstown, west Belfast), Angela Robb (Glengormley, north Belfast) and Catherine Robinson (Ballymena). The students were presented with certificates of industry engagement awarded from the Science Shop, coordinated by Claire Mulrone. Students developed consultancy reports and presented their findings to a joint academic and industry panel. The module, run by Dr Geoff Simmons and Professor Mark Durkin from the Department of Marketing, Enterprise and Strategy in the Ulster Business School, considers contemporary marketing strategy issues in the context of web 2.0 technologies. A key feature of this module is the high level of industry engagement where many local firms such as Pierce Group and TIBUS Ltd have presented consultancy briefs for students to work on. This has proved to be highly beneficial for the firms and the students.